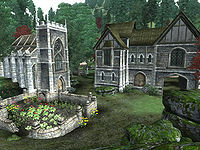 Priory of the Nine is a chapel and priory located southeast of Skingrad (plugin-specific). It used to be the headquarters of the Knights of the Nine, and consists of a small chapel and the main priory building. It also has a stable and archery range. This location only appears after you have installed the Knights of the Nine official plug-in, when it immediately becomes present. The altar in the small chapel is like any other; it will heal you of any ailments that you might have. There is a ladder to the roof, but not much else. The main building is two stories tall and initially contains a bed, a bedroll, and food supplies. On the first floor is a large symbol that can be activated. Unless you have Sir Amiel's ring (obtained during The Shrine of the Crusader) in your inventory, nothing will happen. With the ring, a secret stairway will be revealed, leading to the Priory Basement and Priory Undercroft. See the related quest for more information. 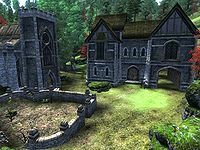 As the Knights of the Nine quest line progresses, the priory building and grounds will be cleaned up by the newly arriving knights. Nature's Fury: Retrieve the Boots of the Crusader from the Shrine of Kynareth. Wisdom of the Ages: Retrieve the Shield of the Crusader from Fort Bulwark. The Path of the Righteous: Retrieve the Mace of Zenithar from the Chapel of Zenithar in Leyawiin. Stendarr's Mercy: Retrieve the Gauntlets of the Crusader from the Chapel of Stendarr in Chorrol. The Faithful Squire: Retrieve the Greaves of the Crusader from Lathon. Priory of the Nine: Retrieve the Cuirass of the Crusader from the Priory of the Nine. After the priory has been fully restored (at the end of the Knights of the Nine quest line), the priory's containers can be used to safely store items. However, storing ingredients and potions in the priory is not advisable, as the knights may take them. Before the quest line has been completed, items should only be stored in the priory with extreme caution. As the priory is cleaned up, several containers disappear completely. Even storing items on the ground is not safe, because new furniture can be placed directly on top of your items, making it impossible to access them. The containers that do not disappear during cleanup, and therefore may be used for storage, are those on the ground floor and those in the bedroom on the second floor. Do not leave followers in the priory before the quest line is complete or they may disappear and be lost forever. Take extra care with quest followers such as Erthor or Martin. Three of the new knights arrive with horses, all of which are found in the stables whenever the knights are at the priory. Geimund has a Bay Horse. Although the horse is identified in the construction set as Geimund's, he does not actually own it, and therefore you are free to use it. Gukimir has a Chestnut Horse. As with Geimund's horse, you are free to use it. Lathon has a Paint Horse. This horse is owned by Lathon and therefore using the horse is considered stealing. After finishing up the Knights of the Nine quest line, you can activate the tombs of the original Knights of the Nine in the undercroft to gain a blessing, specific to the knight's tomb. See here for further details. After part of the Knights of the Nine quest line is completed, you may be able to access repair services in the priory basement. However, this is not always possible due to a bug. Esta página foi modificada pela última vez à(s) 11h37min de 5 de outubro de 2013.